Wow, for the first time in 6 weeks, we actually got through a whole week with no significantly nasty weather to deal with. It was such a treat to not have to get up at zero dark thirty to dig myself out before work! Speaking of a treat, this morning’s tea is quite special. 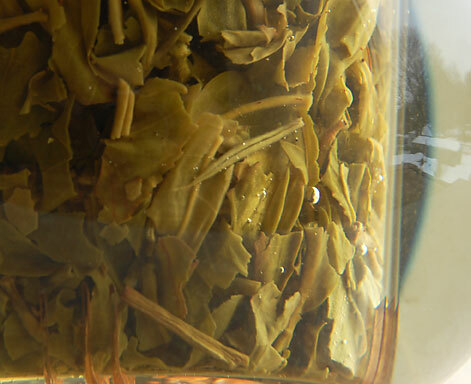 It’s a Darjeeling tea, not a black tea but a green tea, called Arya Emerald. I wrote about the 2007 harvest lot of this tea here. The Arya estate, located in the Himalayan mountains of northeast India, produces special, hand processed tea lots with beautiful gemstone names like Ruby (black), Pearl (white) and Emerald (green). I reviewed Arya Ruby a couple of months ago here. 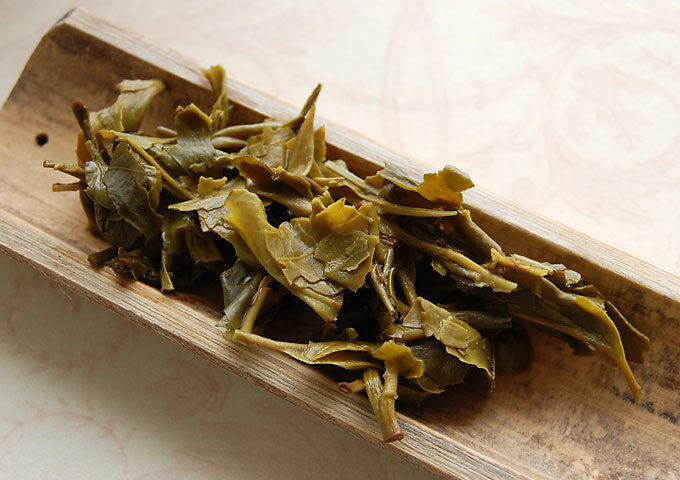 Dry, the dark green leaf is long and twisted with light green bits but a 3 minute steeping unfurled the leaves, revealing many intact leaves that are a beautiful, light olive green. With most green teas, this one included, I use 180 degree F water for steeping. 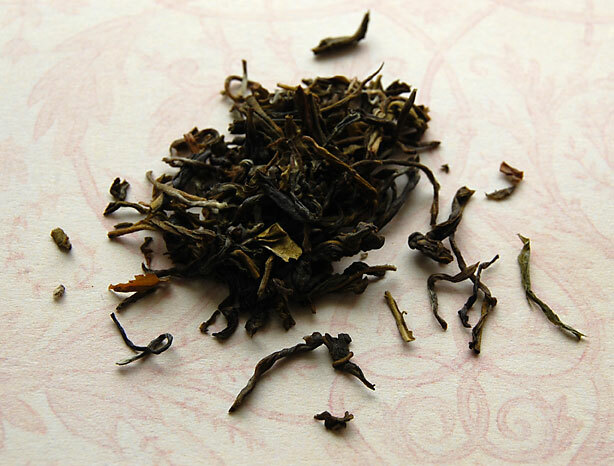 The aroma is lightly vegetal with a hint of Darjeeling astringency. The vegetal quality carries on into the flavor but only lightly so, with notes of tart green grapes and sweet pear which I enjoyed very much. I find it interesting that such intensely green leaves can produce a liquor that is so golden yellow. 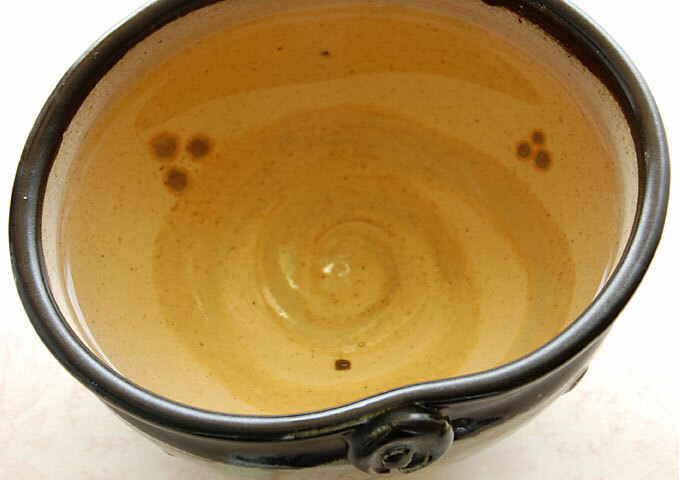 I’ve chosen my spiral teabowl as the light color of the liquor allows me to see the wonderful spiral shape inside the bowl. Do you have a favorite teabowl or mug? What does it look like? One of the things that influences my choice of mug or bowl is the color of the tea liquor. I had an odd experience this week. Normally, when I include a link to a former post in my present post, WordPress sends me a “pingback”. Of course, I know about this already because I was the one to place the link in my post. But this week I received one I didn’t recognize. I discovered that another website called rakkatei was posting my latest post in its entirety as if they had written it! I found this quite disturbing, especially when I couldn’t locate any contact information on the site. I did some research and was able to find a company name and promptly sent them a letter requesting that they immediately remove my content from their website. So, if you’re seeing this post on that website right now, please know that it does not belong to them. I am the author, Karen at Art and Tea. Has this ever happened to anyone? Have a great weekend, dear tea friends, and Happy Valentine’s Day! This entry was posted in Darjeeling Tea, Green Tea, Life Musings, Photography, Tea and tagged Arya Emerald tea, Arya tea estate, tea review. Arya is a great tea estate and I love Arya Emerald. Great share! Happy Tea Sipping! Thanks Benoy, and you as well! 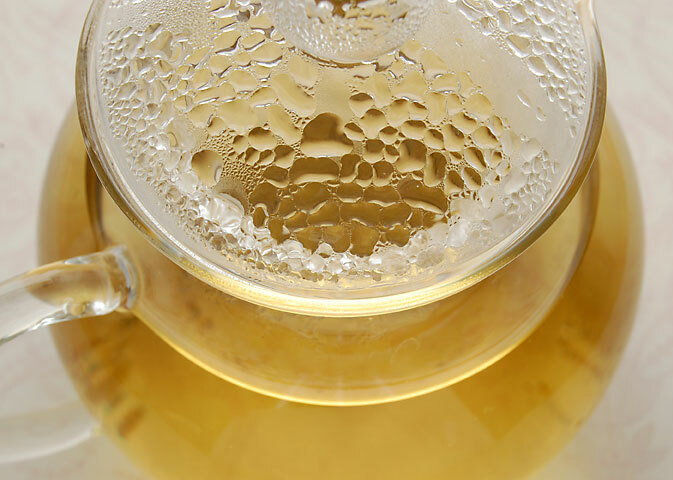 I love the way the steam makes beautiful shapes/textures on your tea pot. The “emerald” color is very pretty. So sorry you found someone using your post info. That is so wrong. Did you contact WordPress? Can they do anything about it? Some people. I always love that, too, Judy. Unfortunately, WordPress can’t help because the people don’t have a WordPress blog. Interestingly enough, I noticed the people put a link to my blog right under the post. I still want them to remove it though because it doesn’t belong anywhere else but here on Art and Tea. I can understand sharing a link or a small quote but the WHOLE post….that’s not right. Thanks!